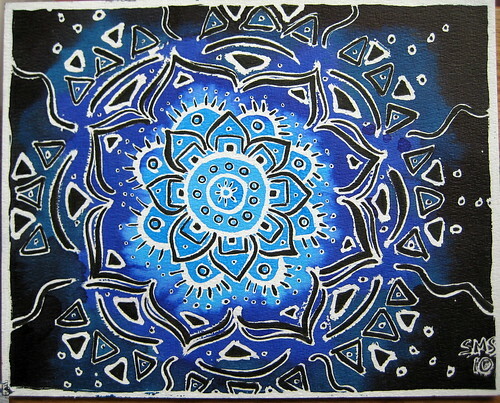 Visionary artist Stephanie Smith will teach a simple process to create a mandala on paper. She will also offer additional techniques for mandala creation by using found objects such as pebbles, seashells, etc. No previous art experience is necessary, and everyone age 17+ is encouraged to attend. All materials will be provided. Call 484-893-0336 to pre-register today. In the last three and a half years, visual artist Stephanie Smith has created over 1200 mandalas on paper using a diverse range of media such as pen and ink, watercolor, markers, and pastel. Impermanent ones have been created using chalk, stones, sticks and seashells but they all share one thing in common- Stephanie creates them as a way to encourage personal growth within herself, and also in the participants of her workshop entitled: Mandala :: An Artful Meditation. By empowering people to express themselves through the use of a focused yet artful process, participants can utilize the mandala not only as a rhythmic meditation, but also as an honest means for self reflection. Drawing on over 5 years experience a corporate trainer, Stephanie makes this material easy and accessible to everyone.